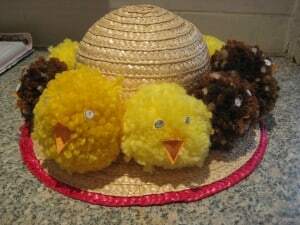 Little is taking part in an Easter Parade at pre-school tomorrow and needs an Easter bonnet. She’s also crazy about chicks, ever since one of the kids at school brought some into class. So, what would suit her better than a bonnet full of chicks? 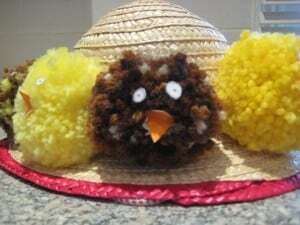 These pompom chicks are really easy to make, and if you use a thick wool they’re quick too. Pre-schoolers will probably need some help in case they get in a tangle but Big can make them by herself with no problem. 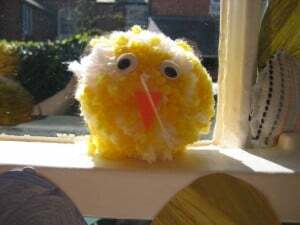 You need: some wool (you can stick with one colour or mix a couple together depending on how you want your chick to look), scissors,2 rings per chick cut from cardboard, card to make eyes and a beak. The size of the rings will determine how big your chicks will be. Place the two cardboard rings together. Take a length of wool (say 75cm-ish) and start winding round the two rings. Keep winding! When you wool runs out, get another length and wind that in. Keep winding and adding more wool. Once the ring is full (fuller = fluffier chick), cut around the outer egde of the ring with your scissors. Take another length of wool and use it to tie a knot INSIDE the two cardboard rings. This is going to hold the chick together so make it a tight knot. Tear off the cardboard rings and your pompom is finished. Any bits of wool sticking out can be trimmed to size. You can trim off the extra length of wool which you used tie your knot, or leave it long so you can hang it up (or tie it on to your bonnet). Glue on some eyes and a beak and your chick is ready. You can use this as an Easter decoration or play with it. Or, make a family of them and tie them round your bonnet. Ahhh, no. But I did try Little’s on for size! 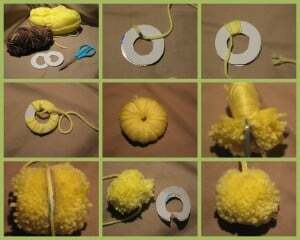 I used to love making pom poms as a child. Don’t think my son is ready for this yet, maybe next year I hope! Aaah a perfect Easter bonnet! !